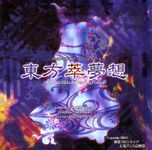 Generally known as the "7.5th" game in the Shrine Maiden series, this game takes place in between Perfect Cherry Blossom and Imperishable Night, and is not developed by Shrine Maiden creator Zun, but by the game group circle Twilight Frontier. The extra character in this game is however, designed by Zun, and the game is an "official" member of the Shrine Maiden series. The game differs from standard fighting games in the aspect that there is a strong focus on long-range attacks and interacting super-attacks. Playable characters are Reimu Hakurei, Marisa Kirisame, Sakuya Izayoi, Alice Margatroid, Patchouli Knowledge, Yomu Konpaku, Remilia Scarlet, Yuyuko Saigyouji, Yakumo Yukari, and Hong "China" Mei Ling.